The adhesive you select will depend largely on your biomedical research laboratory application. If you are building electrodes, you might use a silver-filled, conductive epoxy to connect a Ag/AgCl pellet. For instantaneous bonding when mounting a rodent brain slice, you might select an ethyl cyanoacrylate. When you are looking for a low toxicity adhesive with some elasticity and good moisture resistance, a silicone adhesive is the option of choice. When used with living tissue, an adhesive must be: Non-toxic Able to adhere to organic and inorganic surfaces We offer a variety of silicone adhesives, which are popular for life science applications. KWIK-SIL Applications: Peripheral nerve studies, stereotaxic surgery, electrical or optical measurements. Cure Time: < 5 min. 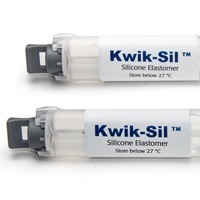 @ 25ºC Our most popular biomedical grade adhesive is Kwik-Sil, a two-part silicone adhesive with very low toxicity. The by-product of curing is hydrogen, making it suitable for use with living tissue. Kwik-Sil is ideal for neuroscience applications and nerve studies. 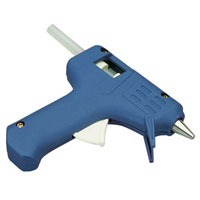 It comes in convenient applicators with special tips that perfectly mix the two parts of the adhesive with every use. This silicone adhesive cures rapidly. KWIK-CAST Applications: Peripheral nerve studies, stereotaxic surgery, electrical or optical measurements. For application in smaller spaces.Cure Time: < 5 min. @ 25ºC Kwik-Cast is similar to Kwik-Sil. While Kwik-Sil is a medium viscosity, Kwik-Cast is a low viscosity silicone sealant. If flows easily and fills small spaces around nerves. It is an excellent sealant for life science applications. Like Kwik-Sil, hydrogen is the by-product of curing, it cures rapidly and it has extremely low toxicity when used with living tissues. KWIK-GARD (Sylgard 184) Cure Time: 24 hrs. @ 25ºC, 15 min. @ 150ºC Kwik-Gard is a uniquely packaged Sylgard 184, a two-part silicone elastomer with a very low dielectric constant. It is a silicone adhesive sealing compound perfect for patch clamping. Like Kwik-Sil, Kwik-Gardis packaged in cartridges that are fitted with mixing tips to make application easier and eliminate the mess of mixing prior to application. RTV Adhesives Cure Time: 24-72 hrs @ 25ºC When you need to bond a variety of materials or require better adhesion, an RTV (room temperature vulcanizing) adhesive might be your silicone adhesive of choice. These adhesives are a good choice for metal electronics circuit applications. 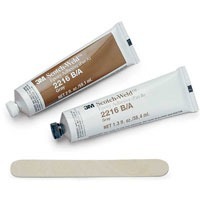 We offer two RTV adhesives. 7128RTV Coating is non-corrosive and requires no mixing, however, it does give off methanol as a by-product. 1571 RTV Sealant bonds well with plastic and also requires no mixing, though it does give off acetic acid as a by-product of curing. 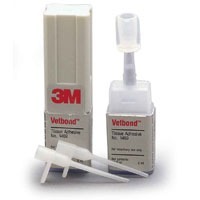 It is a excellent general adhesive for routine laboratory use. This RTV sealant cures at room temperature when exposed to the moisture in the air. After curing, it remains stable and flexible rubber. Whether you are sealing a craniotomy or filling the space between the spinal cord and a newly installed glass window to the spinal cord, a biomedical adhesive like Kwik-Sil is perfect.